Dr. Shrestha is the Vice President of Medical Information Technology, University of Pittsburgh Medical Center, Pittsburgh, PA, the Medical Director ofInteroperability & Imaging Informatics in Pittsburgh, PA, and a member of the Applied Radiology Editorial Advisory Board. The forecast is cloudy with a good chance of performance improvements and meaningful connectivity. Sounds nebulous? Hardly so. Besides becoming the “phrase du jour,” cloud computing, according to Merrill Lynch, is now a $95 billion market.1 The potential to tap this promising platform and do more in medical imaging is more real and pressing than ever before. Cloud computing is defined as a menu of computation, software, data access, and storage services that does not require end-user knowledge of the physical location and configuration of the system that delivers the services. As is the case with certain technologies and “catch phrases”that are in vogue, the word “cloud” has been misused, confused, and abused all too often, causing us to roll our eyes every time a vendor even mentions the word. But the potential for cloud computing to make a tremendous impact in healthcare, and more so in imaging, begs for us to take a closer look at what it is and what it could be. The National Institute of Standards and Technology (NIST)2 has presented the clearest and most comprehensive definition of cloud computing. 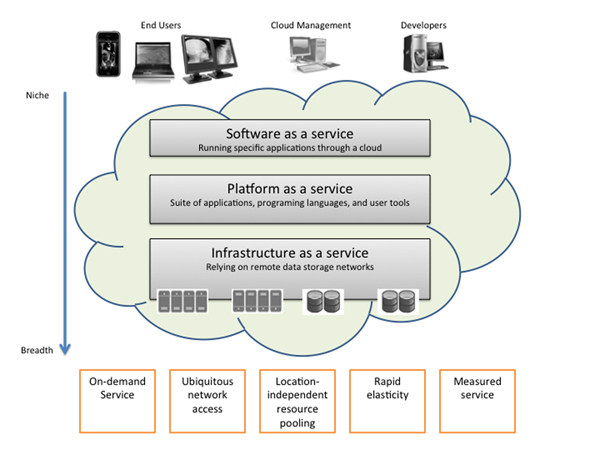 Per NIST’s definition, cloud computing is a model for enabling convenient, on-demand network access to a shared pool of configurable computing resources (e.g., networks, servers, storage, applications, and services) that can be rapidly provisioned and released with minimal management effort or service provider interaction. This cloud model promotes availability and is composed of essential characteristics, deployment models, and various service models. The Institute categorizes cloud computing into 5 key categories: on-demand self-service, ubiquitous network access, location-independent resource pooling, rapid elasticity, and measured service. Cloud computing can take the form of software-as-a-service (running specific applications through a cloud), platform-as-a-service (using a suite of applications, programming languages, and user tools), or infrastructure-as-a-service (relying on remote data storage networks).Cloud technologies can also be deployed as private, community, public, or hybrid clouds. Private clouds are operated for a specific organization, and are more popular in healthcare, whereas community clouds are shared by a number of organizations. Despite multiple arguments that try to push cloud-based technologies solely for the “return on investment” argument (i.e., that it costs less), there is not a clear consensus on this. Cost estimation is often multifactorial, and one has to consider variables such as capacity utilization, the types of cloud, the levels of privacy and security protection, the functionality of the technologies being utilized, and the hardware requirements. Radiology is increasingly dealing with large imaging data sets, complex algorithms, pre- and postprocessing requirements, and an increasingly distributed environment. Distributed data grids perform much more efficiently compared to hard drives, primarily because memory is shared between data centers. Hence, performance is generally better. Cloud deployments afford flexibility to information technology (IT) departments, enabling administrators to anticipate fluctuations in user load so they do not have to scramble to secure additional hardware and software. Furthermore, deployments can also be fairly rapid,and projects can get off the ground in record time. Deployments can also be more effectively and consistently managed across the healthcare enterprise, freeing users from the finer details of IT system configuration and maintenance, allowing them to focus instead on care delivery. Yes, there are real cost savings to be had in embracing cloud-based technologies, but the real argument in favor of cloud computing in the imaging arena is that it enables a more robust workflow. In this era of distributed digital imaging, there are specific and critical needs for radiologists to have the ability not just to access images at the point of care, but also to be able to work efficiently and effectively from multiple locations, with full access to the complete imaging data sets,relevant priors, relevant clinical information, as well as to the right set of diagnostic tools, from any location. After all, it is, all about the clinical workflow. This calls for a strategy that goes beyond just deploying expensive workstations and laying out large data pipes connecting the archives to the reading environments. This calls for a strategy that embraces the power of the Web, thin-client, and zero-footprint client applications and of distributed, cloud-based processing and storage capabilities. The difficulties of sharing images between institutions, physicians, and patients are real and are directly correlated to the successes we are having in the deployment of digital imaging technologies. With the success of the digital revolution in radiology, imaging centers and hospitals are churning out more CDs and DVDs of patient studies than ever before. Although there is a move in the industry toward some level of standardization in the format of these disks, the workflow aspect of image sharing is not fully honed out. This isan area of opportunity that is being filled by cloud-based solutions that permit studies to be loaded to the cloud, enabling secure and convenient sharing of patient images and report data across multiple locations. The challenges become even more apparent when there are multiple picture archiving and communication systems (PACS) and information systems in play, as is often the case across provider spaces. Various types of solutions are emerging now for image sharing. Some business models enable applications that allow patients to easily request and manage access to their images and reports for a small fee, which in turn enables the provider facilities to avoid operating costs and generate revenue when patients request files. Studies can also be pushed from one location to another on an as needed basis—for example, in emergency situations—directly to the target care provider in a matter of minutes. Technologies leveraging the power of the cloud for image sharing are quickly rendering the delivery of CDs by “sneaker-net” or express mail a thing of the past. There is a tremendous opportunity to start a tidal wave of change in the impact of imaging on physician practice behavior, both in the way they interact with the imaging domain(s) and the way they practice medicine. A true enterprise deployment of PACS and advanced visualization (AV) technologies will dissolve the shackles that essentially relegated the AV tools and thick-client workstations only to the specialist radiologists. Ordering physicians, such as vascular surgeons, oncologists,cardiologists, and liver surgeons, are beginning to comprehend the power of having direct access not just to the written report from the radiologist but also to the actual 3-dimensional dataset itself. When physicians are able to click on a 3-dimensional snapshot directly from their workspace, restore the 3-dimensional volume to the very state that the radiologist left it in, and then get direct access right from their offices,clinics and operating rooms to the advanced imaging tools, they suddenly have tremendous capabilities to redefine the way they plan their surgical procedures, patient treatment, and care protocols. There is much activity in the healthcare industry surrounding the federal “meaningful use” incentives for adopting health information technology (HIT). What is becoming clear is that the provisions, at least in phase I, are not directed at radiologists, per se. However, if we decipher the reason behind this federal push, we realize that it really is about continuing to encourage the transformation of care through better connectivity, data exchange, and wider adoption of information technology, and also about bringing the focus back to a patient-centric care delivery model. Cloud technologies play an important role in fostering better models for image and information exchange, whether within a healthcare system or across a health information exchange (HIE). Leveraging interoperability profiles published by the Integrating the Health Enterprise (IHE), including the Cross-enterprise Document Sharing for Imaging (XDS-I) integration profile for imaging, we are now able to realize meaningful connectivity between PACS, radiology information systems (RIS), and electronic medical record (EMR) systems, allowing streamlined methodologies of image and data exchange between these systems and external ones, such as personal health records (PHRs). Furthermore, data processing, data mining, and cloud-analytics capabilities are making connectivity in healthcare even more meaningful. Many higher-end imaging applications today demand constant maximum processing power or power in bursts. Private cloud computing that delivers affordable high-performance cloud computing (HPCC) is now becoming available in medical imaging, allowing radiology to take advantage of the speed and processing power and to push intelligent pre- and postprocessing of imaging data that are directly integrated into the clinical workflows. In order to leverage the power of cloud computing for radiology, particularly for content storage, we can just look at the media and entertainment (M&E) industry. M&E companies typically have huge (usually petabytes), ever-growing libraries of digital media they need to archive for infinity and stream on-demand. Because cloud-service costs are proportional and scalable,M&E companies can add cloud-based storage on an as-needed basis and eliminate hardware management costs altogether. In fact, many have slashed IT costs 50% to 80% by leveraging the cloud.4 M&E companies that need an online platform to distribute digital media leverage the cloud and offer a low-cost e-commerce platform. The transferability of the lessons learned from the M&E industry to medical imaging is remarkable—as we struggle with ever-expanding image storage needs and growing geographical distribution of our provider spaces, we should certainly consider embracing cloud-based image storage solutions. Several vendors are even coming up with solutions that automatically manage and optimize the distribution of rich,unstructured information independent of its geographic location. Some are offering APIs (application programming interfaces) that allowPACS and image management companies to optimize performance for on-demand access to large data sets with flexible policy-based control over their data and a single system for managing cloud data geographically dispersed over a defined area, whether within the hospital(s), state, or country. Cloud-based deployments call for a more robust and sophisticated security strategy. Much of the technologies and tools available do address the many concerns surrounding patient privacy and HIPAA (e.g., in sharing of imaging studies across multiple, disparate provider institutions). However, it is important to not be complacent in this regard. Many choose to opt for private clouds, enabling a tighter level of control over data, and network security. Also, once one chooses to dismantle legacy systems and adopt cloud-based technologies, it is often cost prohibitive, and difficult to make a u-turn. However, the general perception is that the benefits far outweigh the risks, for the right use cases. It is also important to get the facts straight. Some like to use the term cloud more as a buzzword. It is critical to stay informed and one step ahead of the game so as to most effectively find the right fits for this promising technology in individual healthcare settings. A related concern is vendor maturity. As more of these cloud-based technologies start to become a reality for imaging and healthcare in general, application vendors that often have legacy systems need to rethink their product roadmaps and embrace these newer technologies. The imaging department of the future in general will have to deal a lot more intelligently with data. We are on the brink of data and information overload. As we embrace the digital-imaging realm across our healthcare enterprise, we will swiftly continue the transition from terabytes to petabytes of data. Cloud computing offers us ways to tame these challenges so that we are talking more about actionable data and knowledge,and less about the silos of information systems across our healthcare enterprise. Rangan K., Cooke A, Post J, Schindler N. Mendeley. The cloud wars: $100+ billion at stake. http://www.mendeley.com/research/the-cloud-wars-100-billion-at-stake/. Updated May 7, 2008. Accessed March 23, 2011. The NIST definition of cloud computing. National Institute of Standards and Technology. http://csrc.nist.gov/groups/SNS/cloud-computing/. Accessed March 23, 2011. Wyld D. Moving to the cloud: An introduction to cloud computing in government. IBM Center for the Business of Government E. Government Series. http://www.businessofgovernment. org/article/moving-cloud-introduction-cloud-computing-government. Updated October 2009. Accessed March 23, 2011. Alford, TA, Morton, G. The economics of cloud computing: Addressing the benefits of infrastructure in the cloud. Booz, Allen, and Hamilton. http://www.boozallen.com/media/file/Economics-of-Cloud-Computing.pdf. Updated October 26, 2009. Accessed March 23, 2011. Imaging on the cloud. Appl Radiol.